For our final project, we have decided to use the microcontroller provided to make a device which would measure body fat percentage of one’s body. The basic principle behind this project is known as bioelectrical impedance analysis. This technique uses a small alternating current flowing between two electrodes attached to skin surface to determine impedance. By determining the opposition to the electric current through body tissues, we can estimate the water content of the human body and use it to estimate fat-free body mass. The IV response characteristics of these tissues can provide a good estimation of percentage body fat. It has always been easy to record one’s weight loss. However, it is more tedious to measure one’s body fat percentage. Certain methods include skin calipers and hydrostatic underwater weighing which are not simple. One can also roughly estimate their body fat percentage by looking in the mirror. However bioelectrical impedance analysis provides a quick and easy method to estimate one’s fat content. The inspiration of this project is to promote personal health and to track workout progress. The measurement is best taken when the electrodes are placed at the wrist and the contralateral ankle. When measuring the impedance of the cellular tissue, we model it as a resistor in parallel with a resistor and capacitor in series. In this model the single resistor represents the extracellular path and the resistor and capacitor in series represents the intracellular path. 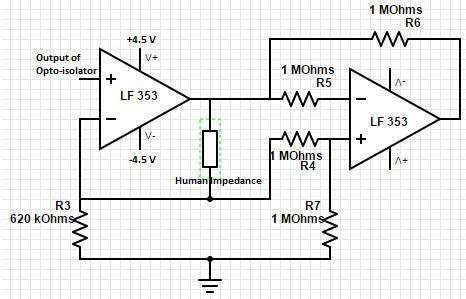 This model shows a change in impedance with respect to the frequency of the AC current. By injecting an AC current through one’s body and measuring the voltage across the electrodes, we can easily find the instantaneous impedance. This project requires a current to go through one’s body which is dangerous so it is imperative to generate a small AC current through the two electrodes, possibly on the order of 10 μA. Since the nature of this measurement heavily depends on how hydrated the body is, there are optimal conditions when using device. The person should: not drink alcohol within 48 hours of the measurement, not engage in moderate or vigorous physical activity within 12 hours of measurement, not eat or drink anything within 4 hours of measurement, urinate within 30 minutes of measurement. Even under these conditions, it is possible to overpredict body fat in more lean bodies and underpredict body fat in obese bodies. In order to calibrate and test the accuracy of our results, we will compare with the skin caliper method of measuring body fat. For this project, a certain amount of hardware complexity was required in order to achieve basic functionality, and couldn’t be translated into software. One piece that could have simplified hardware complexity would be to use a 555 timer or other oscillator to generate the signal input to the subject rather than the microcontroller. This oscillator could be powered off of the same power source as the rest of the biological side of the circuit, eliminating the need for the input signal isolation. However, this increases the difficulty of adjusting frequency. 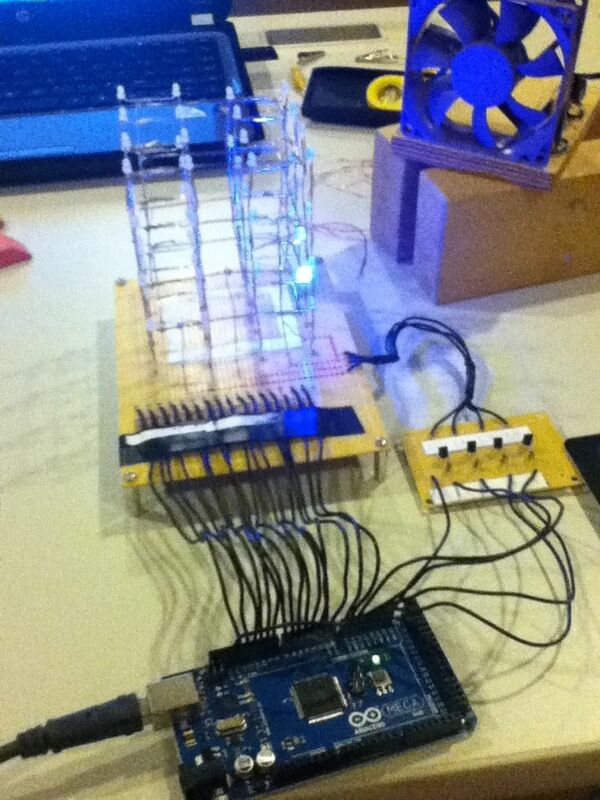 For this reason , we opted to use the microcontroller to generate signal rather than doing it with other hardware. While this increased hardware complexity, we felt that the ease of signal control granted by the MCU was worth the tradeoff. The other major hardware/software tradeoff was in taking user input. Currently, the setup takes user input from a computer UART terminal. The more hardware based alternative would be to take user input from a keypad. While a keypad improves device portability, it is also a less intuitive input method and would restrict the software to a state machine based design. ISO/IEEE 11073 is the family of standards which refers to personal health device communication. They are designed to help healthcare product developers create devices to promote disease management, health, and fitness for global benefit. Under this group of standards, part 10420 refers to device specialization for a body composition analyzer. This standard covers devices that measure body impedances. The EN60601-1-2 standard defines the levels of immunity to electromagnetic interferences and the maximum levels of electromagnetic emissions for medical devices. For example, cellphones may generate strond electromagnetic fields near the medical device. A couple of notable patents were found pertaining to our project. The first is US 661816 B2, “Bioelectrical impedance measuring apparatus” and the second is EP 15651505 A1, “Multifrequency bioimpedance determination”. The first patent involve s a method for using personal data input to assist the bioelectrical impedance analysis. The second patent involves applying current sources of different frequencies in order to measure different body characteristics in order to estimate body fat composition. Our project is a simpler design which calculates body fat percentage with user input parameters and single frequency current source to determine body fat percentage.